An affordable, decent performing set of powered monitors with a ribbon tweeter and a 6-inch woofer. Ribbon tweeter. Solid bass. Connectivity and adjustment options. You'll need to take care matching them if you tweak the EQ. 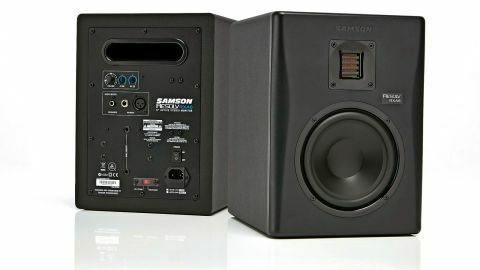 Samson has had Resolv monitors in its range for a few years now, but its latest versions, the RXA5 and the RXA6, are something of a departure from what's gone before as, instead of the more usual dome tweeter, they sport a ribbon tweeter which gives them a different look next to the more conventional nearfield monitor designs, and ought to do something different to the sound too. Samson says that its newly-developed 2.5-inch aluminium tweeter's corrugated ribbon design is able to move four times the air of a standard dome tweeter, resulting in a linear response with extended high-end as well as an accurate phase response and extremely low distortion. Besides that ribbon tweeter, which is driven by a 25 Watt amp, you also get 75 Watts driving a 6-inch copolymer woofer with butyl coating that Samson says forces a fast recovery and quick transient response for tight, low-end performance. The bi-amped, Chinese-built, Resolvs have an MDF construction with a subtly curved front to reduce cabinet-edge diffraction. The black vinyl wrapped finish is stylish but the shiny black plastic of the speaker surrounds looks a little less classy and the Resolv RXA6 logo lights up subtly in white when the monitors are powered up. With a fascia of around 9in wide and 13in high and depth of around 11in, the RXA6s are not too obtrusive for small rooms. They sit on four rubber feet for a degree of isolation but also have two M6 x 10 thread inserts on the rear panel for stand or wall mounting. There's no bass port on the front but round the back there's one in the shape of an elongated oval. Various types of connectivity are catered for by a balanced XLR and jack inputs plus an unbalanced RCA jack and, besides the centre-detented volume knob, there are a pair of tone tweakers - high and low shelving filters. These are small and sunken into the chassis so they are not disturbed but they can be set easily using a thumbnail or screwdriver. Each provides up to 6dB of cut or boost with a centre detente notch for a flat response but they are not stepped for accurate matching of settings for left and right - you just line an arrow up against the markings. Listening to some produced mixes on the RXA6 reinforces Samson's view of how the ribbon tweeter handles the high-end. There seems to be plenty of detail there with the likes of reverb tails being clearly heard and plenty of separation between instruments. "Whether you see a ribbon tweeter as a desired feature or not, these are decent performers that deserve a listen"
The bottom-end seems full and solidly reproduced too, with the woofers and the port combining to offer a tight and controlled bass response. There's enough information there to allow you to shape the low-end of your mixes but, of course, if you really want to hear the extreme low-end, a subwoofer can be added to the system. Between bottom and top, everything else seems to fall neatly into place with nothing too out of kilter with how the same mixes sound on our usual go-to studio monitors, and the stereo imaging is sharp. If you want to really whack things up, there's quite a lot of volume available, with the speakers remaining smooth-sounding throughout that range. As a pair of monitors for working on, both in building up tracks and in mixing, there's nothing about the RXA6 that users should be wary of, with the possible exception of making sure you carefully match left and right if you feel the need to adjust the rear panel EQ. While there is a lot of powerful competition in their price range, you won't find many with a 6-inch woofer and ribbon tweeter combination. But whether you see a ribbon tweeter as a desired feature or not, these are decent performers that deserve a listen.